The big 94708 event this week was the bagging of a mountain lion that was spotted in the parking lot of the former Elephant Pharmacy on Shattuck near Cedar. 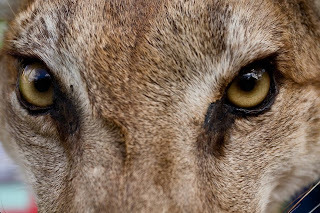 Experts quoted in the Chronicle speculated the beast was addled, but my theory is that where there are abundant deer - and there are deer galore in the lower hills in the summer - mountain lions are bound to follow. It's like how seals attract sharks. Like bears in peopled habitats, this one may have been supplementing venison with garbage - a lion has to eat. But I'm sure deer were on the menu, and only sorry that it didn't make a little more headway on the predator front before being spotted. The BPD are understandably a bit defensive about killing it, but hey, we're predators, too. A hundred pounds of alarmed (if not addled) cat heading my way would be sufficient inducement to shoot. So, here's my point: if the City doesn't cull the summer deer population, expect more mountain lions. You read it here. They are out there, and even a guy that looks like Malcolm McDowell is not exempt from their kitten's claws. Hopefully they will cuttle you soon. Woe ha ha ! What is cool too is the rare red fox sittings - we get - from time to time, but they only appear to the pure of heart. Never saw myself as exempt.